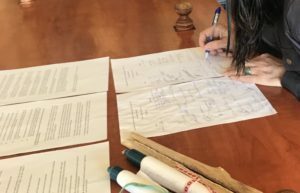 Catriona Jarvis and Syd Bolton, co-convenors of the Last Rights project, celebrate real progress in the struggle for dignified treatment for migrants who lose their lives, with the signing in Lesbos of the Mytilini Declaration in May. 11 May 2018 can be put in the diary as a landmark date for future reference. On that date, more than 50 experts and activists from around the world agreed the final text of the groundbreaking new Mytilini Declaration for the Dignified Treatment of All Missing and Deceased Persons and Their Families as a Consequence of Migrant Journeys. The Declaration calls on States and their authorities to comply with their human rights obligations to protect and promote the rights of all migrants to safe passage and to respectful, fair and just treatment when dealing with the grief and tragedy of those seeking answers, seeking justice and closure for their lost and missing loved ones. The full text is at www.lastrights.net, where organisations and individuals are also invited to endorse the Declaration. Already we are approaching 100 signatures and endorsements from across the world. The Mytilini Declaration has been signed by the UN Special Rapporteur on Extrajudicial, Summary or Arbitrary Executions and has been recommended to the drafters of the soon to be finalised UN Global Compact for Safe, Orderly and Regular Migration. In June, the Declaration was presented and discussed at the recent world conference on Border Deaths at the Free University in Amsterdam. Also in June, Last Rights was invited to a conference in Rome hosted by the Swiss Ambassador to Italy and the International Committee for Missing Persons in relation to the experiences of families, which followed an earlier inter-governmental discussion concerning a pilot Independent Referral Mechanism. Last Rights has previously called for an independent mechanism in each country as the single or main place to which families can turn and which will answer their questions. We now encourage all people who work with refugee and migrant families or have an interest in their protection and well-being to endorse this document, to use it in their own work as a set of clear and unambiguous principles and standards, to hold agencies and authorities to account for how they treat migrants in these situations of distress and trauma. At all levels, whether local, national or internationally, these standards apply to everyone and offer concrete guidance on how to ensure that bereaved families are treated with dignity and respect and can obtain justice. In the next twelve months, the Declaration will be supplemented by a comprehensive set of guidelines, an explanatory note and glossary, in the form of a Protocol. We aim to launch this on the first anniversary of the Declaration. Read the Mytilini Declaration here. Endorse the Mytilini Declaration here. Look at the work of the Last Rights project here.